…you’re family! That’s The Olive Garden’s famous tagline on their commercials. I think they got more “family” than they expected or wanted last Sunday though. Sunday was the unveiling of my father-in-law’s grave marker. Or it was supposed to be. Hubs and K and I arrived at the cemetery early, beating everyone except the Rabbi. We made our way inside the gate and looked around for the covered grave marker. And looked. And walked and looked some more. Hubs had gone straight to the tree he remembered being near the grave a year ago but there was no new stone, no indication he could see that he was in the right place. A few moments later Mom and the others arrived. It soon became clear someone had dropped the ball and the stone had not been placed. There we all were, including a niece who had driven over 300 miles to be there. We stood around in a kind of daze. Mom was so not happy. That is probably the biggest understatement I’ve ever written. Seriously. The unveiling after a year of mourning is the signal in the Jewish faith to give up mourning and move on with your life. Unhappy does not begin to describe my mother-in-law. She told SIL (who had been on the phone dealing with the FUBAR) to tell them if it was possible she’d move her husband and son (Hubs’ older brother’s ashes were buried with Dad) somewhere else and she wanted her money back! We’re talking thousands of dollars and someone screwed up royally. And will probably not have to take responsibility. The Rabbi tried to calm everyone and had us gather around the grave anyway. At his suggestion, Dad memories were shared, then the Rabbi said Kaddish (an Aramaic prayer which is recited after the death of a close relative). Everyone held hands in a loose circle and before long it was over. The Rabbi said we could re-schedule the official unveiling once the stone was in place but after he was gone Mom told SIL to tell them not to cover the stone once it was placed because we wouldn’t be doing this again. A late lunch had been planned to follow the unveiling and that didn’t change; you gotta eat, right? So everyone piled back in the cars and we met at The Olive Garden. Of course with a party of twelve there was a wait. I think the tension began to build during the wait. The niece who had had to drive 300+ miles was antsy and hungry. And not afraid to be vocal though I don’t remember it getting to that point before they had our table ready. The real trouble began when we were taking our seats. I’d moved in one seat from the end of the table figuring Hubs would sit next to me and Mom would sit at the head of the table. A and her husband and baby girl were at the other end and the rest of the family started filling in the middle. Mom swapped seats with Hubs so she was beside me and she wanted her daughter to sit across from her so she and her children could continue to discuss what had happened. P, our niece (daughter of the brother whose ashes were buried with Dad) didn’t want to sit “in the middle” of the row and sat where SIL was supposed to, not caring what Mom wanted. So SIL sat next to her, across from me, still close enough to hear the discussion with her mother and brother. We had already agreed we were ordering alcohol; it was merely a matter of what and how soon they could bring it. Then Mom began talking with Hubs about the mess up at the cemetery, her anger quite evident. Niece asked them if they could talk about it later (like when she wasn’t around) because it was putting her in a bad place, making her anxious. Now remember, SHE CHOSE to sit there. This is a forty-two year old woman; an adult by all appearances. So when Hubs told her no, they wouldn’t be talking about it later, they were going to finish it you’d think she’d let it go, or maybe ask to change seats, right? P put a hand on Hubs’ arm and argued it was never going to be finished. Hubs stood up. 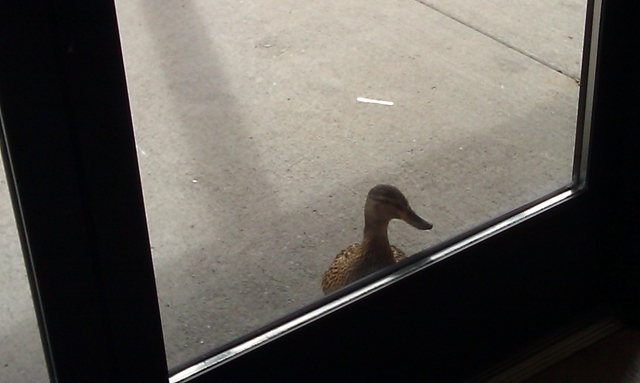 I honestly don’t remember if he said anything then but he turned around and left the restaurant. I proceeded to tell P what I thought of her having no respect for her uncle and what he and his mother wanted, then I got up and followed him. He was already about half way back to our car in the parking lot and when he realized I was following him he stopped me. “I’m not going to talk. I need to be by myself.” I knew then how very angry he was and I went back inside. There’s nothing to be gained by trying to talk him down when he’s that upset. I didn’t realize his daughter A saw me come back (and probably saw how upset I was) and she went looking for him. She told me later he didn’t talk to her but she kept talking to him and offered to swap seats with P, until he finally told her he might come back in a few minutes. She returned and tried to switch seats but P didn’t want to move so A sat in her dad’s chair and when he did eventually come back he let her know she should stay there and he went to the other end of the table. By this time we’d already ordered or I think Hubs would have given me and K the high sign and we’d have excused ourselves. Since food had been ordered he stayed and P got her way as the cemetery issues were tabled, but the tension was thick enough I found it difficult to breathe. The glass and a half of Sangria helped considerably. Later, the bottle of Moscato K ordered was served (let me just say YUMMY!) and I had a glass or so of that. We were eating by then and between the wine and food I was starting to relax. Every now and again Mom would interject that P should have stayed out of her conversation with Hubs; that she had butted into a conversation she wasn’t a part of and P would defend herself. Each time it faded on its own before anyone else got involved. The meal wound down; I shared dessert with Mom and fed a tiny bite of the chocolate mousse to my seven month old granddaughter who I was cuddling. It was a sweet, restful moment in a sea of tension and anger. She even liked the lime wedge her aunty K gave her! We joked about her being a margarita lover in the making. On the walk outside while we waited for SIL to bring her car up for Mom there was more arguing though. P continued to try to defend herself (if you’re really right do you need to defend yourself?) and Mom continued to tell her she should have stayed out of it. Hubs followed us out and was headed back to the parking lot to get our car when P tried to hug him goodbye. She was a little put out when he brushed her off. SIL arrived and I hugged Mom goodbye and BIL helped her to the car. I hugged P and she immediately started trying to explain herself again. I hate to say it but she was basically whining about how hard her life was (remember she’s 42!) and how no one understood. One of her justifications was that her parents divorced when she was 5 and that her dad remarried women who beat her up. Okay, I can be empathetic about that. My mother married and divorced at least six times! And I never even knew my father. But what came out of my mouth was worse. I told her my grandfather had sexually molested me. I don’t usually share that so baldly; and certainly not on the sidewalk outside of The Olive Garden! I guess I was hoping to shock her into thinking about someone other than herself. Would you believe it didn’t work? It didn’t even phase her. She just replied that I’d dealt with my issues. Seriously? That’s your answer? How dare you presume to know what I’ve dealt with? How dare you make every. damn. thing. about. YOU! 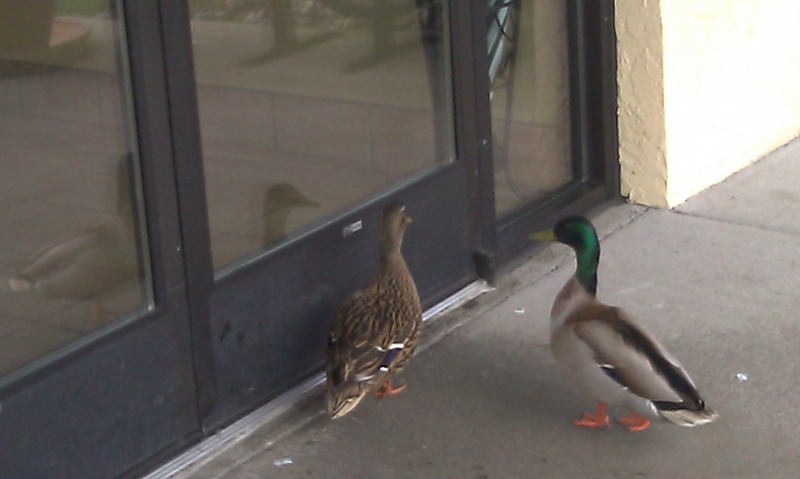 What’s a girl gotta do to get someone to hold the door? Right up until we almost got kicked out of The Olive Garden. Well, to be accurate it probably began going downhill back at the cemetery. But let’s rewind to the good parts shall we? Saturday I rode the bus into Seattle because I’m a wuss and I won’t drive downtown. Have you seen how narrow some of the streets are? If I drove a teeny car I might consider it, but I drive a honkin’ big Suburban and the Beast would not be very happy if I sideswiped a parked car. And by Beast I mean the vehicle; let’s not even talk about how Hubs would react! 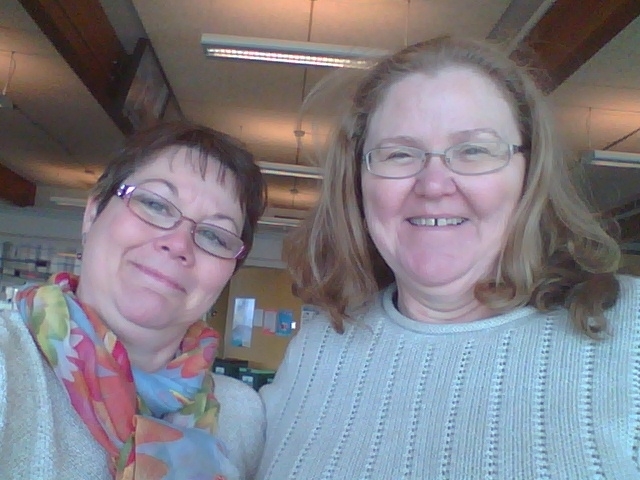 So, I bussed it into Seattle, made my way to the Colman Dock and waited for my good friend Grammy to arrive from The Other Side of the Water. When her ferry docked and we got the hugs and greetings out of the way we headed for Pike Place Market. We started with Tenzing Momo. No, that’s not a typo, that’s the name of the apothecary in the Market. They sell everything from essential oils to all natural soap to incense to herbs of all kinds. They even mix herbs to order. We sniffed a bunch of different oils and bought a few. Got it? If you guessed a toy / gag gift store give yourself a hand! This shop was tiny but packed with all sorts of goodies. I’m bummed I didn’t think to take any photos of the toys but trust me, they were way cool. There were wind-up dinosaurs, clowns, babies … you name it they had a wind-up version. Plus? Giant fake mustaches! And lip balms in exotic flavors like Wasabi and Dill Pickle! No lie. I bought a Dill Pickle lip balm for Hubs, along with Dill Pickle mints! There were bacon scented air fresheners to hang from your rear view mirror and bacon band-aids, not to mention bacon soap! It was a hoot. I plan to go back because they had a stainless steel water bottle I wanted but put off so I could get the one that said Zombie Juice! for daughter K. Which she adored! Grammy picked up a few treats there herself and we did a lot of giggling. 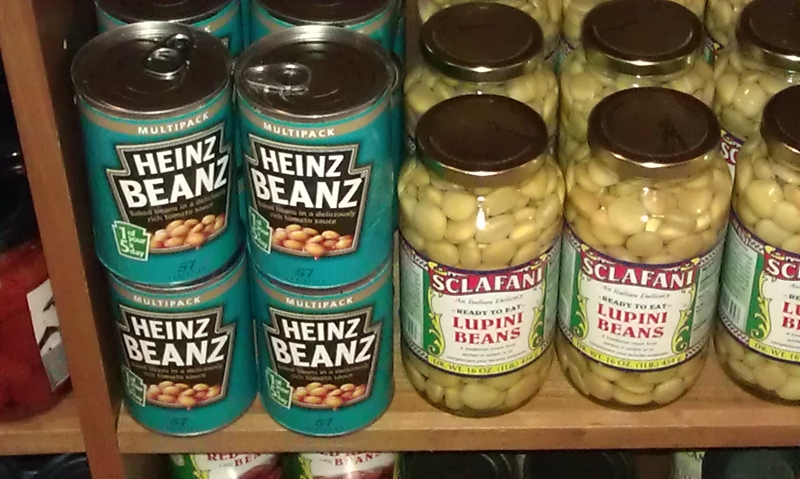 Does it amaze anyone else that amid all the imported goods Heinz has a place on the shelf? Okay, so I’m easily amused. Sue me. After a little break for some ginger ale we explored some more, finding a really aromatic display of nothing but lavender products. They smelled so yummy! Across the aisle from that were the most adorable hats. Their prices weren’t adorable though and we settled for oohing and ahhing. Then we went Down Under, into the lower levels of the Market and found more treasures. Grammy found a scarf she loved and a few other little goodies. I bought a pair of earrings and came close to buying a sweet little leather wrist wallet. It was very, very nice. But even at half off was beyond the budget I’d allowed myself. It was still cool to see though. So. Much. Awesome! Grammy bought some pussywillow and we decided we were ready for lunch. If you ever visit the Market you must eat at Piroshky Piroshky (thanks for the tip Vivi!). There was a line (of course) but it moved quickly. We each chose a pierogi and a dessert pastry, added a bottle of water and went in search of place to sit outdoors. 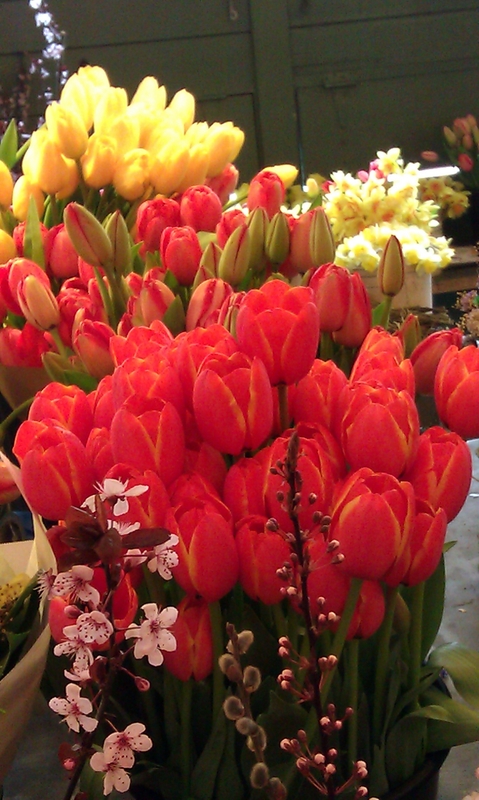 It had gone from chilly to beautiful while we were in the Market. We found an empty bench near a small park area and munched and gabbed away. The people watching was fun and we enjoyed the sunshine. It was a perfect. Later, we made our way back to the ferry terminal stopping along the way to buy decadent chocolates and try on silly hats (I’m sorry now I didn’t let her take my picture in one; that would have been a hoot). Right next to the hat store was a tea shop where they offer free tastings. I didn’t want to taste because I knew what I wanted and they actually had my Jasmine Pearls green tea! Score! Two very happy, very tired ladies. So. Much. Fun. Thanks for the great day Grammy! Safe travels home. Lots and lots of Kleenex®. Sunday is the unveiling of Dad’s grave marker. In the Jewish faith they may unveil the marker after the initial 30 day mourning period or as long as a year later. March 23rd it will be a year since Dad passed. The stone is going to be beautiful; I saw the proof the engraver sent to my SIL. Pink marble (it’s nicer than it sounds) and his name in both English and Hebrew. There’s another tradition Jews practice with respect to visiting graves. If you ever watched Schindler’s List you may recall seeing survivors leaving stones on Schindler’s grave. I didn’t recall that scene but I’ve witnessed the practice in other movies and read about it. My Jewish Learning talks about the origination of this practice and the fact that no one really knows for certain how or why it started. Our daughter K emailed last week to ask whether I thought it was an okay idea for her to have a stone engraved with a message from her to leave on the grave. This is what got me thinking of the tradition and I immediately asked to join in her plan. She wasn’t sure then what she wanted on hers but I knew right away what mine would say. I’ve posted before about my feelings for this wonderful man. If you’re a regular reader you’ve more than likely read that post so I’m not going to link to it here. If you haven’t read it and want to you can find it in my archives. So Friday I left work fifteen minutes early and grabbed a bus down to the Fauntleroy ferry terminal like I used to do when we had our five acres out in the country. We still have a friend who lives on the Peninsula and we were having dinner with her. Hubs picked me up on the other side and we spent a pleasant few hours visiting. Then our fasting began. Damn it. Because Hubs has chronic conditions which require daily meds the doc is serious about keeping an eye on him by checking his blood pretty regularly. Saturday morning was Vampire Day so we couldn’t eat or drink anything after midnight. I was also having blood drawn as part of my annual physical. In addition to not eating or drinking from about 10:30 or so I didn’t get to take my ibuprofen or tylenol for 15+ hours! Talk about pain! I hurt in places I didn’t know I had! I have to say I like how light this one is. 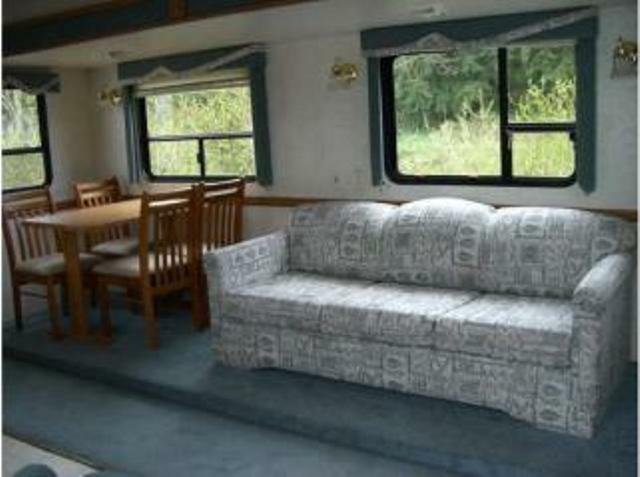 Our floor plan is similar – sofa on the right, table on the left; but our interior seems a bit darker. Of course that’s with the blinds down. While we were parking it I was inside hooking up a heater and the wall sconces were on and it was very cozy! Okay, it isn’t my kitchen but it is very similar. I think my oven door is black. 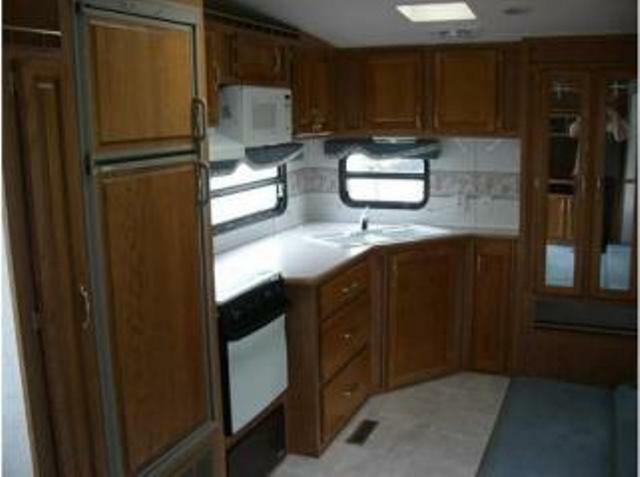 The cabinets are all the same though and the fridge and those mirrored doors. Hubs is out there right this very minute swapping LED bulbs for the ones that we didn’t get around to switching Saturday night and introducing the dogs to their home away from home. I don’t think he gets it that I’m ready to hit the road! 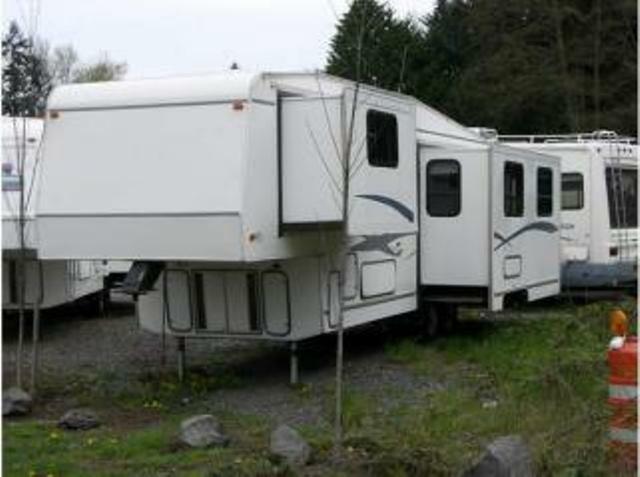 I spent time on Friday looking up the campground near our friends and checking on availability for Memorial Day weekend. I’ve already asked for the first three days of Thanksgiving week off so we will have nine days to drive to Southern California and visit the oldest daughter and her family! And I so want to go back to the ocean to camp this summer! What have you got planned for the summer? Just really, really busy. Sigh. I’m hopeful I can put up a real post soon though. I also hope everyone is well out there in internet-land! But soooo much fun! Yeah, it was really only two days but it FELT much longer. Probably didn’t help that Sunday we headed up to see Mom and go over old family photos with her so we could put names on them. I’m not sure how long I took down names but there were over 200 photos! By the time we were done my hands were killing me. We did something else up there that was a lot more exciting than writing down names, but I can’t talk about that yet. Comicon was … hmm, trying to find an adjective that is appropriate. So many fit here. Fabulous! Terrific! Stupendous! Amazing! Since this was our very first Con we learned a lot. Namely, that we had a LOT to learn. Daughter K wanted to get a photo with Danai Gurira (Michonne of the The Walking Dead) but she learned too late that the sign-ups for photos were back where we exchanged our tickets for our badges. By the time she found out they were full up. So next year she knows to head there first after getting her badge. Another thing we discovered is that you really want to have a plan before you get there. I wanted to see the show with Wil Wheaton and Paul and Storm. It began at 10:30 (check-in began at 10 am – do the math … or the time I guess). We got to the show late and were able to find seats, barely. It was fun and funny and I’d do it again, but only if I could sit closer to the stage. I think it will have to take a back seat (see what I did there?) to other activities next year unless they schedule it differently. Looking over the Program Guide Monday morning, I noticed a few other panels/shows that I would have loved to see (and Hubs probably would have enjoyed more). So Lesson 2: check out the schedule in more detail before the Con so you can pick out activities everyone will like. Without further ado, here are some of the photos we took on Saturday. All of these were taken by my daughter or I using our cell phones. You’ve heard me mention the Doctor’s TARDIS in the past. Well here are two extremely different examples proudly sported by fans. Awesome, am I right?! This guy told my daughter he’s going to get K9 next. I hope I run into him next year, I’d love to see that! 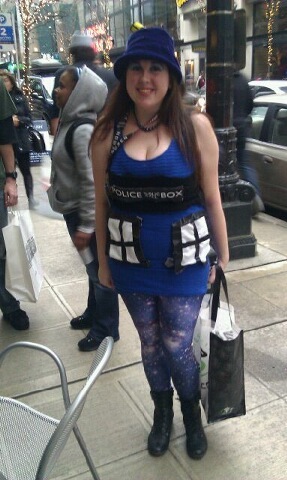 The young lady’s tights are nebulas and stars and she even has the police box light on top of her hat. Dedication right there! The young woman here was kind enough to pose for me. You can’t see her “tails” sweeping down her back from her headpiece. I should have angled her in front of the window to get those too. Yep, that’s a light sabre she’s holding. Here’s more Star Wars fun! 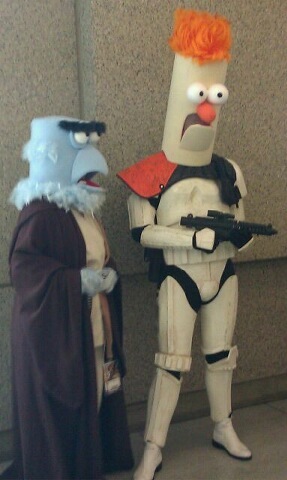 We saw Beaker and Sam early on but we were checking in and couldn’t really spend time gaping at their coolness. Later though K was able to get this shot. I just wanted to hear Beaker; maybe next year. Another Star Wars vignette. 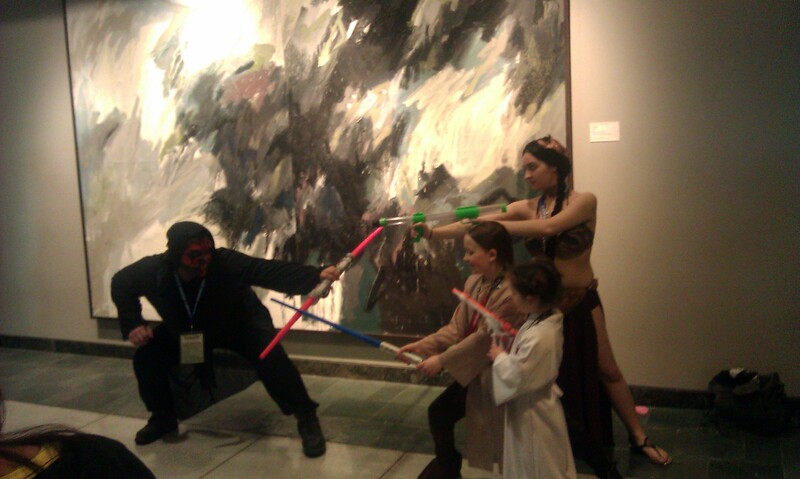 For those of you who don’t recognize them, that’s Princess Leia with a couple of junior Jedis doing battle with Darth Maul. 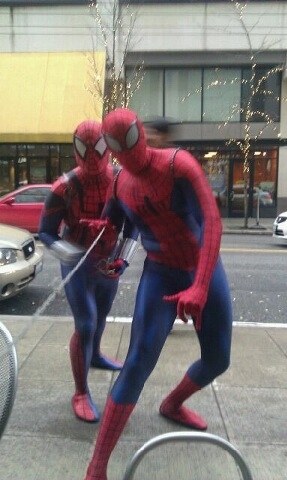 Here’s Spiderman times two! I’m not sure why they were traveling in tandem but they certainly look the part. So cool! 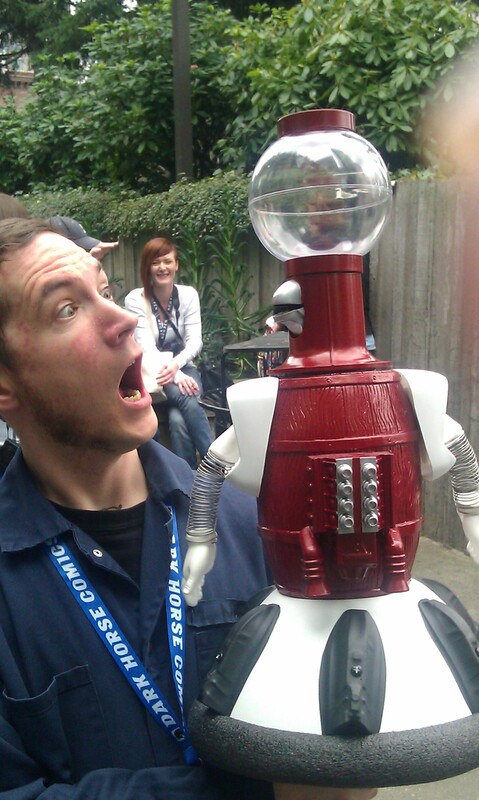 Of course you all know that’s Tom Servo right? From Mystery Science Theater 3000? The guy mugging there built him! I missed a LOT of good photos due to a combination of bad timing, learning curve with the cell phone camera and my innate shyness (shut up, I am too shy!). There was one shot I really regret missing. Hubs and I were eating lunch while waiting for K and across from where we were sitting was a Doctor Who ensemble posing for photos. Doctors Four, Ten and Eleven were all present. There was a fourth Doctor there who I Hubs said was the Seventh Doctor – straw boater, striped pants. I know they were fans dressed up but they all looked really good! And they were having fun with it, which I love to see. The plan for next year (which I’ve been drafting in my head since we got home and change up regularly) is to rent a hotel room downtown; take off early from work the Friday Comicon opens and check in that afternoon. If we get our badges Friday night we save time in line when the main crowd arrives Saturday morning and we can sleep in a bit longer! If you think I’m kidding about the mass of people here’s what a Con minion told us while we waited in line with her at Subway, “They’re expecting 75,000 people today.” That was Saturday alone peeps! No wonder it was so crowded! In beautiful downtown Seattle today Emerald City Comicon begins at 2 pm! The 3-day passes are sold out (I believe I mentioned that here). Saturday tickets are sold out. Sunday tickets are sold out. So if you want to attend and you don’t have an “in” with someone you’re stuck with today. If you get there in time that is. 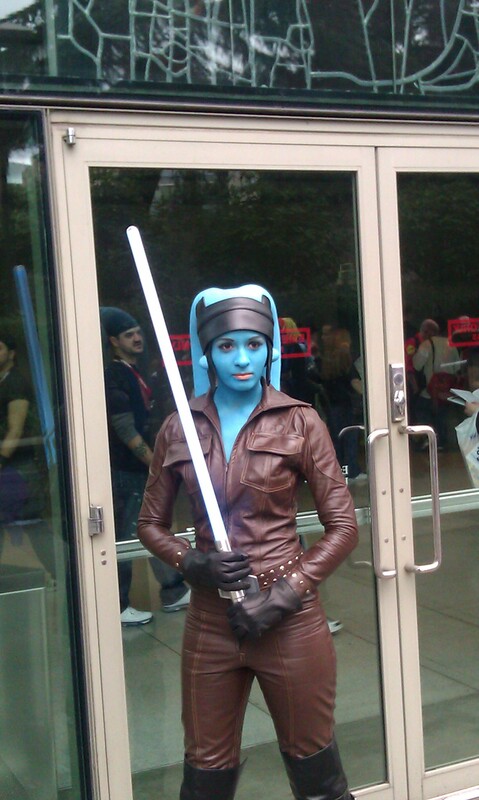 Comicon is being held at the Washington State Convention Center where they estimate attendance will be 20,000! I think the line is going to reach to the ferris wheel! 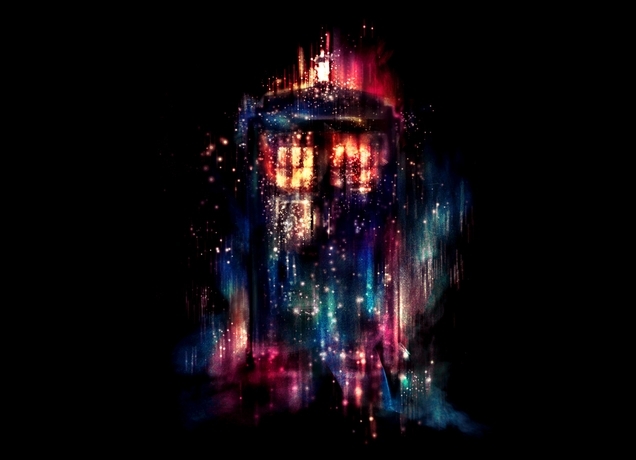 For those of you who are unfamiliar with this image, it’s a TARDIS. The Doctor travels through time and space in this puppy. 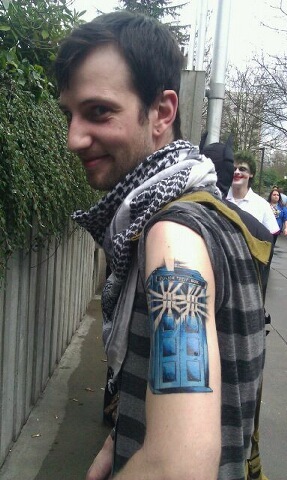 And it’s bigger on the inside ;). (If you know Doctor Who you may be laughing at that. If not, oh well.) The designer of this shirt caught the TARDIS in mid-jump. I love the simplicity of it, not to mention the colors! Stay tuned! I hope to post afterward with photos and maybe even a funny story or two. Have a great weekend everyone!